When Ford introduced the Escape in the early 2000s, the company officially entered the small sport utility vehicle market. The Escape uses a unibody construction, similar to a sedan, and is front-wheel drive. In essence, it is a sport utility vehicle that is designed to drive like a sedan. Unfortunately, the Escape still takes it most basic features, including a high center of gravity, from SUVs. If you or someone you love suffered injuries in a Ford Escape rollover accident, contact the Ford Escape rollover lawyers of the Willis Law Firm at 800-883-9858 today. Since the Escape is a sport utility vehicle, its risk of rolling over is greater than that of many other passenger automobiles. In particular, the Escape has a short wheelbase in addition to having a high center of gravity. As such, the Escape distributes its weight over a short distance. These are problems that Escape owners have reported in the past. Individuals who have been injured in Ford Escape rollover accidents can learn more about their legal rights and options from a Ford Escape rollover lawyer. The Ford Escape rollover attorneys of the Willis Law Firm may be able to help victims of Escape rollover accidents fight to hold the Ford Motor Company accountable their injuries. Contact us today at 800-883-9858 for more information. Pictured to the left is a 2001 Ford Escape that rolled over killing the Texas couple. 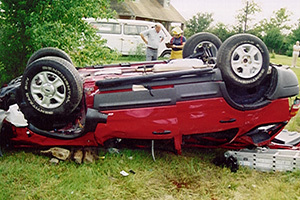 During the rollover, severe roof crush of the roof pillars and roof supports occured. The roof and weight of the vehicle in the rollover crushed the occupants. Both occupants were properly seated and had their seatbelts on.